70s and 80s fashion have seriously won my heart this year. 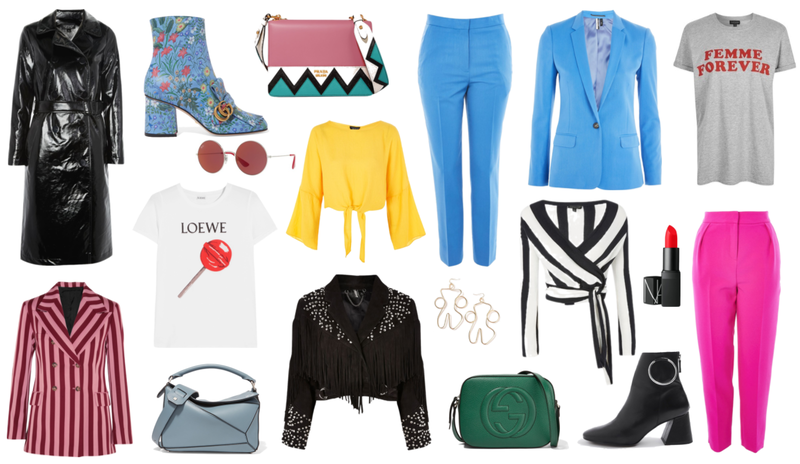 Fringed jackets, power suits and the brightest trousers you ever did see - I want them all! My birthday is coming up next month, so obviously I've been scouring the high street for the best goodies to splash out on. I'll have made it through 20 years on this planet, so I think that's plenty enough reason to go totally overboard treating myself, amirite? OK, so I definitely don't have a spare £1,500 to spend on that INSANE Prada bag (one day, one day...) but I can definitely see my bank account draining rapidly this payday. Oh Topshop, you know the way to my heart. I'm quite literally the heart eye emoji right now! Let me know your fave pick in the comments and what you've got your eye on this Summer. Happy early birthday!! The striped Alexa Chung blazer will always be a favorite of mine, but I'm also loving those black ring boots you have picked. I actually almost bought that "Femme Forever" shirt a few months ago but at the last minute decided not to... now I'm really regretting it! Haha!